EN, OSHA and NFPA compliant—independently fire tested and approved by FM Approvals and MPA Dresden. Hybrid-close door action—manual close doors stop in any position, but self-close in the event of a fire to protect contents. 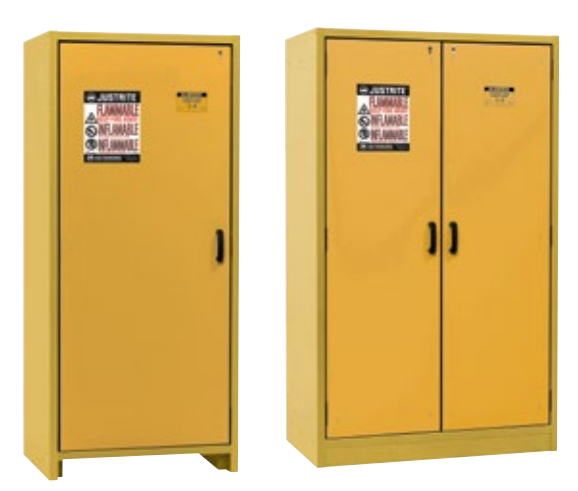 Designed to provide 30-minutes of fire resistance, attractive two-toned yellow cabinet is constructed with a body of melamine resin and flame retardant special plates, and a steel door front covered by a textured, durable powder-coat finish. Under fire conditions, special intumescent protection strips expand and seal hermetically to close gaps between the door(s) and frame to reduce heat entering the cabinet. Hybrid style door(s) operate manually and stop in any position, but in the event of a fire, the built-in fusible link system will melt and release to allow automatic closure of door(s) at 122°F (50°C). Cabinets are EN compliant, FM-approved and meet NFPA 30, NFPA 1, and OSHA standards. Cabinets have many of the same features as the 90-minute model, including leak-proof, removable bottom sump with perforated insert, adjustable powder-coat finish steel shelves with 1-inch (30-mm) lip and load capacity of 165-lbs (75-kgs), Haz-Alert warning label, and a ground connection. Air vents close securely at 158°F (70°C) in the event of a fire and include flame arresters and caps. Independent cylinder lock on door(s) provides added security. Bright interior colour offers maximum visibility to stored goods. Integrated transport base makes it easy to reposition empty cabinets. Accepts removable base cover (optional).